Harry Leroy "Roy" Halladay III (born May 14, 1977), nicknamed "Doc", is an American former professional baseball player who pitched in Major League Baseball for the Toronto Blue Jays and Philadelphia Phillies between 1998 and 2013. His nickname, coined by Toronto Blue Jays announcer Tom Cheek, is a reference to Wild West gunslinger "Doc" Holliday. He was the Blue Jays' first draft selection in the 1995 Major League Baseball draft, the 17th pick overall, and played for the team from 1998 through 2009, after which he was traded to Philadelphia. Halladay is known for his ability to pitch deep into games effectively and, at the time of his retirement, was the current active major league leader in complete games with 67, including 20 shutouts. On May 29, 2010, Halladay pitched the 20th perfect game in MLB history, beating the Florida Marlins by a score of 1–0. On October 6, 2010, in his first post-season start, Halladay threw the second no-hitter in MLB postseason history (Don Larsen's perfect game in the 1956 World Series being the first) against the Cincinnati Reds in Game 1 of the 2010 NLDS. It was his second no-hitter of the year (following the May 29 perfect game), making Halladay the fifth pitcher in major league history (and the first since Nolan Ryan in 1973) to throw multiple no-hitters in the same season. During the 2012 season, he became the 67th pitcher to record 2,000 strikeouts. Halladay is also one of only six pitchers in MLB history to win the Cy Young Award in both the American and National Leagues. Born in Denver, Colorado, Halladay grew up in the suburb of Arvada; his father was a pilot for a food-processing company, while his mother was a homemaker. From an early age, Halladay loved baseball, trying every position on the field until, by age 14, his success on the pitcher's mound attracted the attention of major league scouts. By the age of 13, he had begun training with Colorado baseball guru Bus Campbell, who had helped almost every promising pitcher from the Denver area, including Goose Gossage and Brad Lidge. In 1995, after graduating from Arvada West High School, he was selected by the Toronto Blue Jays in the amateur draft, in the first round, as the 17th overall pick. He was promoted to the major-league club as a September call-up in 1998. In his second career start, against the Detroit Tigers on September 27, 1998, Halladay had what would have been the third no-hitter ever pitched on the final day of a regular season broken up with two outs in the ninth. The feat would have joined the combined no-hitter by four Oakland Athletics pitchers (Vida Blue, Glenn Abbott, Paul Lindblad and Rollie Fingers) in 1975 and Mike Witt's perfect game in 1984. The bid was broken up by a Bobby Higginson solo home run. The home run was the only hit Halladay would allow in a 2–1 Blue Jays victory, as he recorded his first major league win. During the 2000 season, Halladay sported a 10.64 earned run average (ERA) in 19 games, 13 of which he started, making his 2000 season the worst in history for any pitcher with at least 50 innings pitched. At the beginning of the 2001 season, Halladay was optioned to Class A Dunedin Blue Jays to rebuild his delivery. Halladay's fastball was clocked up to 95 miles per hour (153 km/h), but it had little movement, and his pitches were up in the strike zone, which was ultimately the reason why his 2000 season was so unsuccessful. He worked with former Blue Jays pitching coach Mel Queen. The problem, Queen realized, was Halladay's total reliance on his strength—his attempt to overpower batters with straight-ahead pitches. Within two weeks, Halladay had altered his arm angle for a more deceptive delivery, and added pitches that sank and careened. Instead of throwing over the top, he chose to use a three-quarters delivery (the middle point between throwing overhand and sidearm). Originally a fastball pitcher, he became reliant on keeping his pitches low across the plate, regardless of the type of pitch thrown. The adjustments proved successful. After a month and a half, he was promoted to Double-A Tennessee, and a month later, to Triple-A Syracuse. By mid-season, he was back in the Blue Jays' rotation. He posted a 5–3 win–loss record with a 3.19 ERA for the Blue Jays in 16 starts in 2001. In 2002, Halladay had a breakout season, finishing with a 19–7 record, while posting a 2.93 ERA with 168 strikeouts in 239.1 innings. Halladay was named to the American League All-Star team. On March 16, 2006, Halladay signed a US$40 million, three-year contract extension that would last through 2010. During that year, Halladay finished near the top of the MLB in wins with 16. He was named to the American League All-Star Team as a reserve on July 3, along with four of his Blue Jays teammates. It marked the second-most appearances in club history, and Halladay's fourth as an All-Star. Although Halladay's strikeout total was lower in 2006 than in previous seasons, his ground ball/fly ball ratio, complete games, and innings pitched were all among the American League leaders. Halladay was the American League pitcher of the month in April 2007, going 4–0, highlighted by a 10-inning complete game win over the Detroit Tigers. However, he pitched poorly in his two starts in May, and on May 11 was placed on the disabled list and underwent an appendectomy. He returned to the rotation in his usual form on May 31 against the Chicago White Sox. Halladay went 7 innings, giving up just six hits and allowing no runs on his way to his 100th career win. 2007 also saw Halladay hit his first career RBI. Against the LA Dodgers on June 10, his ground ball single to center field allowed John McDonald to score. He shut out the Seattle Mariners on July 22, allowing only three hits. In 2008, for the sixth consecutive year, Halladay was Toronto's opening-day starter, improving his own club record. He lost 3–2 in a pitcher's duel with New York's Chien-Ming Wang. His first win of the season came in his next start against Boston, when he outpitched Josh Beckett in his season debut. In his third start, Halladay pitched a complete game against the Texas Rangers, in a 4–1 win. Three of his nine complete game efforts resulted in losses due to Toronto's underachieving offense early in the season. In fact, those three complete game losses came in three consecutive starts. On June 20 against the Pittsburgh Pirates, Halladay was struck in the temple by a line-drive off the bat of Nyjer Morgan. The ball caromed off Halladay's head and was caught by third baseman Scott Rolen, ending the inning. Halladay was able to walk back to the dugout, but was taken out of the game for safety concerns. Although he was given a clean bill of health for his next start, it was later suggested by television commentators that Halladay may have in fact suffered a temporary lapse in recognition of what happened on the play. Halladay pitched his 10th career shutout against the Seattle Mariners on June 30. He limited them to four hits in his sixth complete game of the season. The shutout tied him with the Cardinals' Mark Mulder for 10th among active pitchers. On July 11, 2008, Halladay pitched his 7th complete game and second shutout of the season against the New York Yankees, allowing 0 runs on 2 hits for his 38th career complete game. Halladay was named to the American League All-Star Team as a reserve. He pitched in the fourth inning, yielding only one hit and striking out Lance Berkman. In his last start of the season, he fittingly pitched a complete game against the Yankees to win his 20th game of the year. In so doing, he became the first pitcher to win five games against the Yankees in a single season since Luis Tiant in 1974. In addition, he led the AL with a 1.05 WHIP. Halladay finished second in the 2008 American League Cy Young Award voting, behind Cliff Lee of the Indians. He also led the AL with 9 complete games, and struck out a career-high 206 batters (two more than his 2003 season) as well as posted a 2.78 ERA (the second-best of his career) that was second only to Cliff Lee's 2.54 ERA. Halladay also became just the fourth pitcher in major league history to post two seasons of 200 strikeouts and fewer than 40 walks. He was presented the George Gross/Toronto Sun Sportsperson of the Year award. On April 6, 2009, Halladay made his team-record seventh straight Opening Day start for Toronto, defeating the Detroit Tigers. Halladay then also won his next two starts, on the road against the Cleveland Indians and the Minnesota Twins. Halladay would lose his next game to the Rangers giving up 5 earned runs over 8 innings only to go on and win his next 6 games to bring his record up to 8–1 with a 2.75 ERA. With season-ending injuries to planned 2009 Jays' starters Dustin McGowan and Shawn Marcum, and with #2 starter Jesse Litsch on the disabled list early in the season, Halladay led a staff of young, mostly inexperienced starters. Halladay was named the AL Player of the Week for the period ending May 17. Doc was 2–0 with a 1.13 ERA over 16.0 innings in his two starts the week prior. In a game against the Los Angeles Angels of Anaheim on June 2, Halladay struck out 14 batters and threw 133 pitches, both career highs. On June 12, he left the game early because of a strained hip adductor muscle, commonly referred to as a pulled groin, and was placed on the 15-day disabled list on June 17. On July 5, he was selected to represent Toronto at the All-Star Game. On July 14, he started the All-Star Game for the American League, pitching 2 innings and giving up 3 runs, of which 1 was unearned. That year, he was named #7 on the Sporting News's list of the 50 greatest current players in baseball. A panel of 100 baseball people, many of them members of the Baseball Hall of Fame and winners of major baseball awards, was polled to arrive at the list. 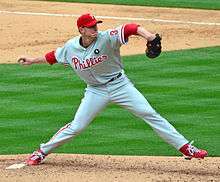 On December 15, 2009, Halladay was traded from the Blue Jays to the Philadelphia Phillies for minor league prospects Travis d'Arnaud, Kyle Drabek, and Michael Taylor. He agreed to a contract extension worth US$60 million that includes a US$20 million vesting option for a fourth season. Halladay made his first postseason start in Game One of the National League Division Series, as the Phillies squared off against the Cincinnati Reds. Halladay threw a no-hitter, giving up only one walk (to Jay Bruce in the fifth inning) in a 4-0 victory. Halladay's was only the second postseason no-hitter in Major League Baseball history, and the first since Don Larsen's perfect game in the 1956 World Series. He threw only 104 pitches. Halladay become the first pitcher in Major League history to throw a perfect game and a no-hitter in the same season. The Phillies swept the Reds in three games to advance to their third consecutive National League Championship Series, where they faced the San Francisco Giants. Halladay started Games One and Five, which were one of the most touted postseason pitching matchups in recent history as he faced another former Cy Young winner in both games, Tim Lincecum. Halladay lost Game One 4-3 and won Game Five 4-2, as the Phillies were eliminated in six games by the Giants, who went on to win the World Series. In 250 2⁄3 innings pitched, Halladay finished the 2010 regular season with a 21–10 record and a 2.44 ERA, setting a career high with 219 strikeouts while issuing just 30 walks. He led the National league in wins, innings pitched, and complete games (9), including 4 shutouts. He became just the seventh pitcher in the history of Major League baseball to pitch 250 or more innings with 30 or fewer walks, the first pitcher to do so since Grover Cleveland Alexander in 1923 with the Chicago Cubs. On May 29, 2010, Halladay pitched the 20th perfect game in MLB history, against the Florida Marlins in Miami, retiring all 27 batters and striking out 11, allowing no hits, runs, walks, or errors. This was the first time in the modern era that two pitchers (Dallas Braden of the Oakland A's and Halladay) had thrown perfect games in the same month and that multiple perfect games had been achieved in the same season. When Halladay's former manager, Cito Gaston, called to congratulate him, Halladay was unable to take the call because he was busy with the post-game media frenzy. On August 24, 2010, to commemorate his perfect game, Halladay presented around 60 Swiss-made Baume and Mercier watches he had purchased to everyone in the clubhouse. The watches were presented in brown boxes that bore the inscription: "We did it together. Thanks, Roy Halladay." Additionally, the back of each watch was engraved with the date of the game, the line score, and the individual recipient's name. On October 6, 2010, in his first postseason appearance, Halladay pitched a no-hitter (his second of the season), against the Cincinnati Reds in the first game of the National League Division Series (NLDS). He became the second player ever to pitch a no-hitter in the postseason, joining Don Larsen of the 1956 New York Yankees, who pitched a perfect game in the World Series. He also became the first pitcher since Nolan Ryan in 1973 to throw two no-hitters in a season, as well as the seventh pitcher to hurl both a perfect game and a regular no-hitter in his career, joining Cy Young, Addie Joss, Jim Bunning, Sandy Koufax, Randy Johnson and Mark Buehrle. Halladay allowed just one walk to right fielder Jay Bruce with two outs in the fifth inning, and faced just one batter above the minimum 27. This also marked the first time in Major League history that a pitcher threw a perfect game and a no-hitter in the same season. The fans voted his no-hitter as the "This Year in Baseball Awards" Postseason Moment of the Year. In May, Halladay was named the 2011 winner of the John Wanamaker Athletic Award, by the Philadelphia Sports Congress, based on his 2010 season. In June, Halladay was presented the Best Major League Baseball Player ESPY Award, for his performance since June 2010. On July 12, Halladay was the NL starting pitcher in the All-Star Game. Halladay went 19–6 in 2011, with a 2.35 ERA, and pitched 8 complete games, second most in the Majors. The Phillies won their fifth consecutive National League East championship, and also finished with the best record in baseball for the second straight year. Halladay was named the starter for Games One and Five during the National League Division Series against the St. Louis Cardinals. He won Game One 11-6, but lost the Game Five 1-0 which was a duel with former Blue Jays teammate Chris Carpenter. This loss eliminated the Phillies from the playoffs, a disappointment as they were touted as heavy favorites for the World Series, and it would turn out to be Halladay's final postseason appearance. Reflecting on that series at his retirement, Halladay said "I think the one thing I took away from that is you can have the best team on paper, you can have the guys who want it the most. But when the squirrel runs across home plate while your team is trying to pitch, there is nothing you can do about that." On April 5, 2012, Halladay threw 8 innings of shutout ball against the Pirates on Opening Day, giving up 2 hits while striking out 5. On May 29, Halladay was placed on the 15-day disabled list with a shoulder strain. It was his first DL stint since 2009. In a press conference on June 6, Halladay stated, "Ultimately, my goal is to finish my career with the Phillies and win a World Series here. Some of those things are not fully in my control, but my intent is to play here and finish my career here and be here as long as I can." Halladay stated this during his press conference about his shoulder injury, which he revealed that he will sit out three more weeks, and then re-evaluate his condition. The injury would eventually be diagnosed as a strained latissimus dorsi and Halladay was hopeful he would be able to return shortly after the All-Star break in July. On July 17, Halladay came off the DL and was the starting pitcher against the Los Angeles Dodgers. He pitched 5 innings, giving up 5 hits and 2 earned runs while fanning 6 in a no-decision which the Phillies would go on to win, 3–2. In a loss against the Atlanta Braves on July 29, Halladay recorded his 2,000th strikeout to become the 67th pitcher in MLB history to reach the milestone. Even though Halladay was on the DL and had the worst ERA since first starting off his career, he still remained above .500 going 11-8. After struggling in spring training, Halladay gave up five runs in his first start in the Phillies second game on April 3, 2013, striking out nine in 3 1⁄3 innings pitched. After struggling in his prior starts, Halladay pitched eight innings allowing just one run on April 14, 2013, against the Miami Marlins whom the Phillies defeated 2–1. Halladay recorded his 200th career win in the game. On May 5, Halladay gave up nine earned runs in just 2 1⁄3 innings. The next day, Halladay was placed on the disabled list with a right shoulder injury. On May 8, it was announced that he would have surgery on his shoulder to have a bone spur removed. The surgery will also address fraying of his labrum, and rotator cuff. Though he was initially supposed to be making a rehab start in Double-A for the Reading Fightin' Phils that day, an 18-inning game the previous night caused the Phillies to have a shortage of pitchers and as such, Halladay returned to the major leagues on August 25 for a start against the Arizona Diamondbacks in which he threw six innings, allowing two runs on four hits with two walks and two strikeouts. On December 9, 2013, Halladay signed a ceremonial one-day contract with the Blue Jays and announced his retirement from baseball due to injury. At his press conference, Halladay listed a persistent back injury, as well as wanting to be more involved with his family, as his reasons for retiring. Although retired as a player, Halladay continues to be a part of the game as a guest instructor for the Philadelphia Phillies and Toronto Blue Jays. Halladay's distinctiveness was characterized by his ability to throw a hard two-seam sinking fastball ranging in the low 90s with pinpoint control. In addition, he threw a four-seam fastball in the low 90s, a curveball in the high 70s, and cut fastball from 90–92 mph which he had modified the grip for in 2007 at the suggestion of former catcher Sal Fasano. Halladay threw the hardest cutter among MLB starters in the 2011 season, at an average of 91.4 mph. The changeup is one pitch that Halladay had problem commanding in the past, which he had used very rarely. But since joining the Phillies in 2010, Halladay started throwing a change-up pitch that is really a version of the split-finger fastball (called a "split-change") that he used as a strikeout pitch with the help of pitching coach Rich Dubee. In spite of his reputation as a ground ball pitcher who works at an efficient pace, Halladay's strikeout totals increased steadily in the few final years of his career. Halladay's efficiency and durability were reflected in his total innings pitched every year, also due to his ability to strike out hitters and induce ground ball outs to escape jams. He often led the league in innings pitched and complete games, while ranking among the leaders in WHIP and ERA. Prior to and during each start, Halladay had a distinct trademark in which he went into a complete "isolation mode", immersing himself in complete concentration and in more or less his own words: To plan every pitch he would pitch while on the mound. During this time, he would not talk to anyone except the manager or the pitching coach. He would not even reply to a "hello" or wave from a teammate or spectator, nor talk to the media until he had been relieved or had completed the game. Halladay has two children with his wife, Brandy. He and his wife were raised as members of The Church of Jesus Christ of Latter-day Saints, although they are now non-practicing. During the offseason, Halladay and his family live in Odessa, Florida. While he was a member of the Toronto Blue Jays, Halladay and his wife invited children and their families from the Hospital for Sick Children into "Doc's Box" at Rogers Centre during Blue Jays games. The remodeling of the suite to be more kid-friendly was documented in an episode of Design Inc.. As part of Halladay's contract with the Blue Jays, he also donated US$100,000 each year to the Jays Care Foundation. He was the Blue Jays' nominee numerous times for the Roberto Clemente Award for his work with underprivileged children. For the same reason, he was also the Blue Jays' nominee in 2008 for the Players Choice Awards Marvin Miller Man of the Year Award. ↑ Hagen, Dan (December 26, 2009). "More More than an ace on the hill". Salt Lake Tribune. Retrieved December 27, 2009. ↑ Zolecki, Todd (6 September 2013). "Sent to 'pen, Martin gets encouragement from Doc". phillies.com: News. MLB Advanced Media. Retrieved 7 September 2013. ↑ Gilbert, Erika (June 2, 2009). "With 14 K's, Halladay first to nine wins". MLB.com. ↑ In the double row of awards (above the random baseball cards), click on "Starter" for video. 2010 This Year in Baseball Awards. MLB Advanced Media, L.P. Retrieved 2011-01-03. ↑ Zolecki, Todd (October 27, 2010). "Halladay voted Clutch Performer of the Year". MLB.com. Retrieved April 14, 2011. 2010 MLB Clutch Performer of the Year. MLB Advanced Media, L.P. Retrieved 2011-01-03. The MLB Clutch Performer of the Year Award was first awarded in 2007. 2007 Awards. MLB Advanced Media, L.P. Retrieved 2011-01-03. ↑ Phils’ Halladay Earns PSWA ‘Pro Athlete of the Year’ Award. PSWA Dinner website. Retrieved 2010-12-16. ↑ Divish, Ryan (28 March 2011). "Cole Hamels, Roy Oswalt, Roy Halladay, Joe Blanton, Cliff Lee". The News Tribune. Retrieved 9 February 2014. ↑ Corcoran, Cliff (21 September 2011). "Phillies' much-hyped rotation even better than expected". Sports Illustrated. Retrieved 9 February 2014. 1 2 "Phillies' "Phantastic Phour" rotation arrives". WTSP. 14 February 2011. Retrieved 9 February 2014. ↑ Stark, Jayson (14 December 2010). "Measuring Phillies' rotation historically". ESPN. Retrieved 9 February 2014. ↑ And The Winners Were ... See all the John Wanamaker Athletic Award-recipients since 1961 webpage. Philadelphia Sports Congress website (Philadelphia Convention & Visitors Bureau). Retrieved 2011-05-23. ↑ Video: Halladay wins 2011 Wanamaker Award. Philly.com. Philadelphia Media Network. June 29, 2011. Retrieved 2011-08-25. ↑ For the complete article, scroll down, below the advertisements. "Halladay takes his place among Philly's finest". Philly.com. June 29, 2011. Retrieved August 17, 2011. ↑ "Halladay Honored with 2011 Wanamaker Athletic Award; Eagles Youth Partnership and Francisville A's Volunteer Coaches also recognized". Philadelphia Convention & Visitors Bureau. June 28, 2011. Retrieved August 24, 2011. ↑ Mayor Honors Award Recipients at Wanamaker Ceremony. Philadelphia Sports Congress website (Philadelphia Convention & Visitors Bureau). Retrieved 2011-08-24. ↑ For the complete article, scroll down, below the advertisements. "Halladay wins Wanamaker Award". Philly.com. May 17, 2011. Retrieved May 23, 2011. ↑ Leach, Matthew (Oct 7, 2011). "Carpenter's gem sends Cardinals into NLCS: Game 1 against Brewers on Sunday in Milwaukee". MLB.com. 1 2 "Roy Halladay retires with Blue Jays". 9 December 2013. Retrieved 9 December 2013. ↑ Tony Jackson (November 18, 2011). "Clayton Kershaw wins NL Cy Young". ESPN LA. Retrieved December 7, 2011. ↑ For the other members of the MLB Insiders Club Magazine 2011 postseason team, see Baseball awards (several awards below the rookie awards). MLB Insiders Club Magazine selected its first All-Postseason Team in 2008. Boye, Paul. All-Postseason Team. MLB Insiders Club Magazine (ISSN 1941-5060), Vol. 5, Issue 1 (December 2011), pp. 30–31. North American Media Group, Inc.
↑ Donnellon, Sam (December 25, 2011). 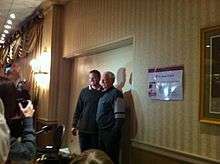 "City of Roy: Halladay named 2011 Sportsperson of the Year". Philadelphia Media Network. Retrieved 2011-12-28. ↑ Zolecki, Todd (18 July 2012). "In Doc's return, Phils rely on Pence's clutch hit". MLB.com. Retrieved 18 July 2012. ↑ Zolecki, Todd (29 July 2012). "Halladay reaches milestone with 2,000th strikeout". MLB.com. Retrieved 30 July 2012. ↑ Berg, Ted (28 March 2013). "Halladay's struggles continue in final spring start". USA Today. Retrieved 4 April 2013. ↑ Murphy, David (3 April 2013). "Roy Halladay does not look like Roy Halladay". High Cheese – Philly.com Blog. Interstate General Media. Retrieved 4 April 2013. ↑ "Halladay gets 200th win as Nix homers in 9th to help Phillies beat Marlins". delcotimes.com. Journal Register. 14 April 2013. Retrieved 14 April 2013. ↑ Iseman, Chris (26 August 2013). "No issues for Halladay day after making return". phillies.com: News. MLB Advanced Media. Retrieved 28 August 2013. ↑ "Roy Halladay says back injury, desire for family life prompted him to sign one-day deal and retire with Toronto Blue Jays". National Post. December 9, 2013. Retrieved December 12, 2013. ↑ "PitchFX Leaderboards". Baseball Prospectus. Retrieved 17 September 2012. 1 2 Verducci, Tom (April 5, 2010). "What Makes Roy Run". Sports Illustrated. Retrieved August 2, 2010. ↑ "Roy Halladay's wife Brandy Halladay". Playerwives.com (Player Wives & Girlfriends). July 7, 2009. Retrieved August 16, 2010. ↑ "Toronto Blue Jays". ESPN. Retrieved 17 March 2013. ↑ Jordan Bastian (September 6, 2006). "Halladay proud to be Clemente nominee". Toronto Blue Jays official site. Retrieved May 16, 2009.